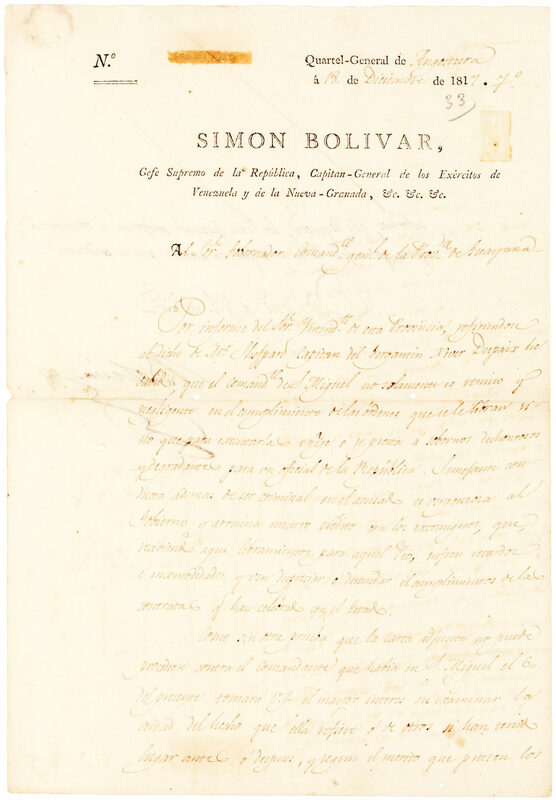 BOLIVAR, SIMON. (1783-1830). South American soldier, statesman and revolutionary leader. LS. (“Bolivar”). 1½pp. Tall 4to. 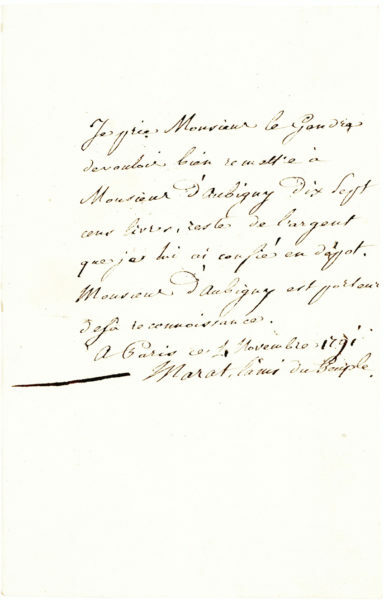 Angostura, December 18, 1817. To the Governor General of the Province of Guyana. In Spanish with translation. 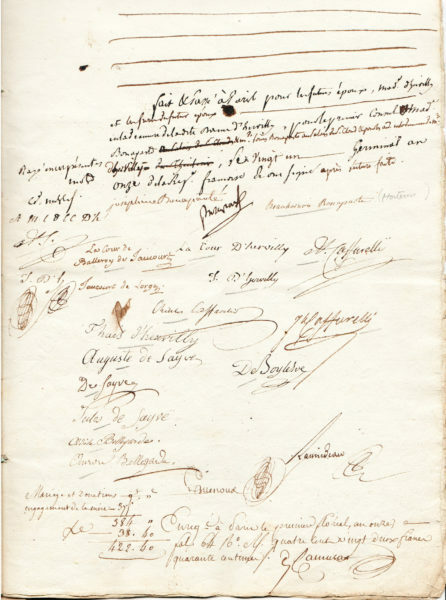 “Thanks to the report of the Intendant of this Province, which referred to the remarks of Mr. Sheppard, captain of the brig Never Despair, I have learned that the commander of San Miguel is not only remiss and negligent in following the orders issued to him but that to carry them out he demands or accepts bribes which are dishonest and degrading for an official of the Republic. Such conduct, besides being criminal on the part of the accused, brings shame on the Government and ruins our reputation among foreigners, who, receiving payment orders here for the port [? ], suffer delays and inconveniences, and see the contracts they have made with the State scorned and neglected. Born into a wealthy family of Spanish aristocrats in Venezuela, Bolivar was orphaned at a young age and raised by family slaves and private tutors, who instilled in him a strong sense of justice and liberty. After attending the Milicias de Veraguas military academy, he sailed to Europe for further education and witnessed Napoleon’s coronation in Paris. He returned to Venezuela in 1807, committed to fight for independence from Spain. Bolivar was a part of the delegation to Great Britain after the 1810 coup which formed the Supreme Junta of Caracas, and distinguished himself during the ensuing Venezuelan War of Independence. 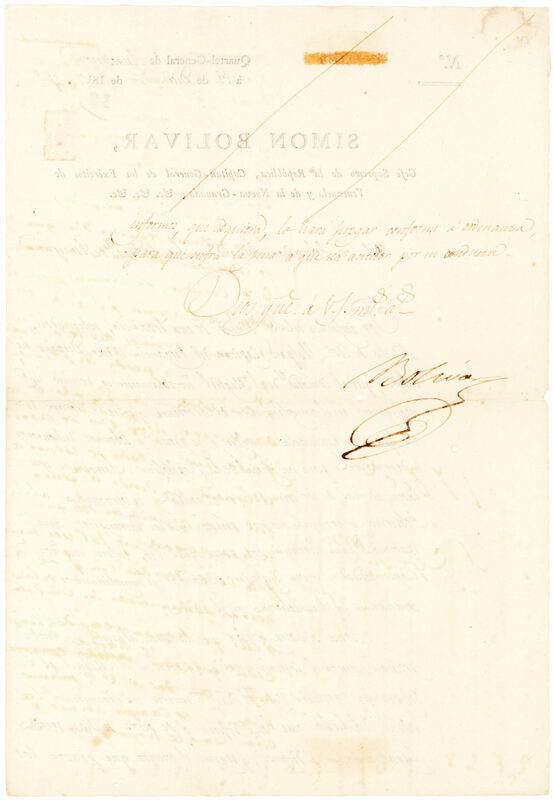 After the fall of the First Republic of Venezuela in July 1812, Bolivar led the campaign to free the country from Spanish control, enlisting the recently formed United Provinces of New Granada in his so-called Admirable Campaign of 1813, during which Bolivar earned the moniker El Libertador and captured Caracas from the royalists to re-establish the Venezuelan Republic. However, by 1815, Bolivar found himself at odds with the government of Cartagena and sought refuge in Haiti, a country that provided him with the means to return to Venezuela. In January 1817, he began the siege of the city of Angostura (renamed Ciudad Bolivar in 1846), located on the shore of the Orinoco river in the province of Guayana. “This region was the most strategic base for his operations, for whoever held the province and plains would eventually control all of Venezuela,” (Bolivar, Worcester). By July, Bolivar and his comrades had captured Angostura but “the Liberator” soon realized that the cause was being hampered by a lack of clear leadership and a formal government. After executing his closest political rival and pressuring others to bow to his authority, Bolivar set about formalizing his government, declaring Angostura the provisional capital and establishing a high court and governing council while he and his guerrilla army still fought the royalists to the west. 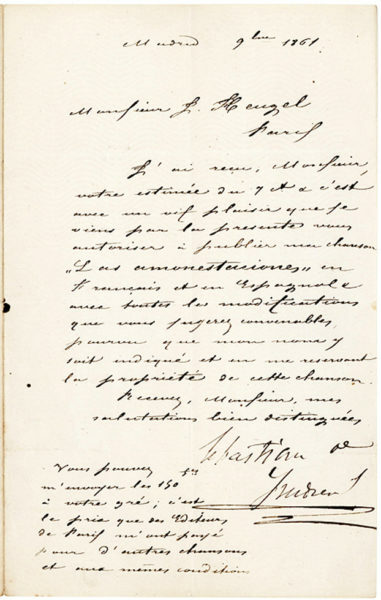 Our letter shows the hands-on nature of Bolivar’s governance and his intention to establish a good reputation for his nascent government, especially in the international community. 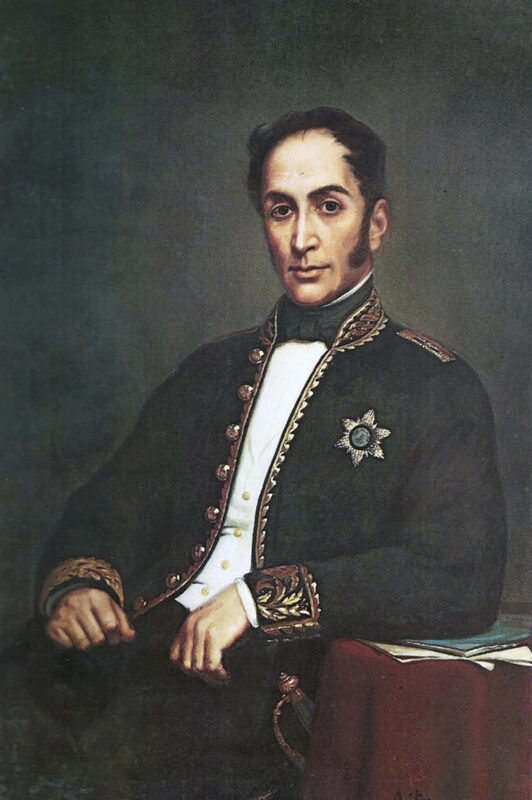 Although Venezuela remained a captaincy of Spain, Bolivar ruled the Third Republic of Venezuela as a dictator until February 15, 1819, when the Second National Congress, held in Angostura, elected Bolivar president, leading to the unification of Venezuela and New Granada into the Republic of Gran Colombia. 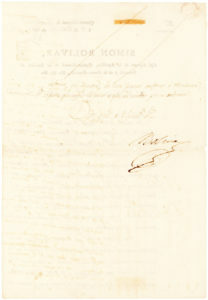 Written on a sheet of partially-printed letterhead that lists Bolivar’s title as “Supreme Chief of the Republic, Captain-General of the Armies of Venezuela and New Granada, etc. etc. etc.” Several pin holes in the left margin as well as four small worm holes not affecting the text; otherwise in fine condition.